Millions of people run or jog on a regular basis for many different reasons. There are a myriad of physical and mental health benefits associated with regular running and the barriers to participation are relatively low. You don’t need to join a gym, buy expensive equipement or spend time travelling to the gym or pool. You just need to put on your trainers and head out the door. Therefore whether you are running as part of preperation to compete in another sport such as football, preparing to run a 10K or even the Edinburgh marathon or just to get fitter, you will hopefully find the information below useful. How often do runners get injured? Runners are unfortunately fairly common visitors to our clinic in Eskbank near Edinburgh, therefore you can rest assured that our physiotherapists are highly experienced in the assessment, treatment and rehabilitation of runners and running injuries. Gennerally running ailments can be devided into acute injuries secondary to trauma such as spraining an ankle or straining a calf muscle and overuse problems such as tendinopathies. Research into running injuries has identified several general trends. 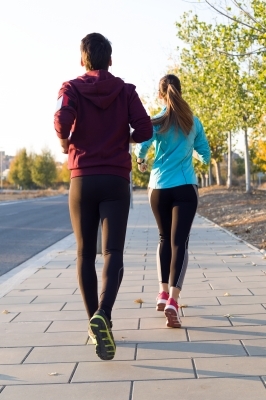 The first is that novice runners tend to have an increased risk of injuries. The second is that the risk of injury tends to increase as the runner’s total millage and/or training intensitity increases. These findings are not surprising, the human body has a immense capacity to adapt to the physical loads that are imposed on it. Bone, tendon, ligament, muscle etc all show positive changes in function in response to physical stress or loading. This positive response to loading is generally referred to as remodeling. The key however is that this stress has to be just right. Too little and you don’t get as big a positive response if any and too much can lead to overload and eventually pain and injury. Therefore the key to any successful training programme is to impose the right level of stress and then progressively increase the level of stress at the right rate. Problems therefore arise when the level of stress is excessive. For example novice runners push too hard, before their bone and soft tissues have a chance to toughen up and experienced runners up the millage or intensity too aggressively in attempt to chase performance. What are the most common running injuries that we see? Runners commonly present to our clinic with acute injuries, including sprained ankles and muscle strains or tears. Ankle sprains are often due to a momentary lapse of concentration or misjudgement in combination with uneven or icy ground. Certainly it is a reason for considering running indoors on a treadmill when it is dark or icy outside, unless the area that you run is well lit and the pavement or road is well maintained and even. The crucial factor with acute ankle sprains and indeed any ligament sprains, is to ensure that they are adequately rehabilitated to minimise problems in the future. Acute muscle strains or tears commonly occur when you initially start running at the beginning of a sesson or if there is an increase in intensity. For example if you do some sprints or intervals or even if you are running at a steady pace and you start going up hilll. As with acute ligament sprains the key is to ensure that the acute muscle strain or tear is properly treated and rehabilitated. To ensure that you both return to running as quickly as possible and that you minimise future problems. Runners frequently present to the clinic with injuries or problems that they have had for a significant length of time. Somewhat arbitarilly injuries that have been present for more than 6 weeks are classed as chronic. Although the terms chronic and overuse are often used interchangeably this isn’t really correct. An acute injury such as a sprained ankle which is not managed appropriately and is still problematic after 6 weeks would be referred to as a chronic injury. However it could not be regarded as a overuse injury. Whereas achillies tendon pain which has been present for over 6 weeks and has gradually worsened over time; would be regarded as being both a chronic and a overuse injury. Whilst this may seem to be a pedantic point, it is important because a badly managed acute injury which has become chronic should be managed very differently to a chronic overuse problem. Typically runners will present with low back pain and lower limb problems such as hip pain, knee pain and ankle pain. Although they will occassionally present with neck and/or arm problems which are normally postural in origin. Low back pain in runners is often fatigue related, that is the pain or discomfort comes on after the patient has been running for some time. For example if your training is structured so that you have shorter speed sessions and a longer session. It is common for back pain to be aggravated towards the end of longer session. If this is the case it is essential to identify which element of your trunk or core stability is lacking, so that you can specifically correct this. As just “running” is obviously not suficient to specifically strengthen it. It is important to bear in mind that pain in and around the hip in runners is often not caused by the hip. Assuming that the lumbar spine and associated structures are excluded and a hip problem is identified. There will often be a specific lack of muscle power, endurance, control or flexibility which results in your pain getting progressively worse the longer you run. The knee is the most common area that runners have problems have. Patellofermoral pain also referred to as runners knee and anterior knee pain, is probably the most common knee problem that we see in the clinic. Generally the underlying cause is a lack of strength and stability at the hip and lumbar spine, although quadriceps strength can also be an issue. Patellar tendinopathy can also be an issue, particular if you have increased the volume or intensity of speed or hill training. The cornerstone of effective rehabilitation of patellar tendinopathy as with any tendinopathy, is eccentric strengthening. At the ankle the most common problem we see is achilles tendon pain, generally due to achilles tendinopathy. As mentioned above eccentric strengthening of the tendon is the key to successful management. Infrequently runners can sustain a achilles tendon rupture. It must be stressed that poorly managed and incompletely rehabilitated achilles tendinopathies do appear to predispose an individual to an achilles tendon rupture. So our advice would be to make sure that any niggling achilles injures are dealt with appropriately. Runners also present with sprained ankles, both actute and chronic. Often a runner will sustain a sprained ankle which is then inadequately rehabilitated, which then means that they are more likely to sprain it again. Therefore our advice once again would to ensure that any minor problems or injuries are adequately rehabilitated. Children can present with all the problems mentioned above, in particular patellofemoral pain. Although tendon ruptures woud be extremely unlikely. However children do have their particular problems such as traction apophysitis. These are particulary common around and just after growth spurts. All of the staff at Midlothian Physiotherapy LLP run or have run in the past. Between us we have run marathons, half marathons and 10K’s. So you can be sure of a sympathetic ear from someone with personal experience of running, whatever the problems you have. We commonly treat runners and running injuries, so you can rest assured that you are in good hands and that we will have you on the road to recovery as quickly as possible. The vast majority of the problems which we see in the clinic respond well to physiotherapy, however if your problems don’t we are in an ideal position to expedite your referral onwards to the right person. If this were to be the case we would liase with your GP to ensure this happens as smoothly and as quickly as possible. Please contact us if you have any questions or to make an appointment with one of us in our Eskbank clinic just outside Edinburgh. We are open from 8 am until 8 pm Monday to Thursday and from 8 am to 6 pm on Friday. We have no waiting list and don’t require a referral from your GP if you are self funding. We are registered with the major health insurers, we would suggest that if you want to use your health insurance that you contact your insurer to make sure that their procedures are followed and that you are not left out of pocket. This entry was posted in Conditions we treat and tagged Ankle pain, Hip pain, Knee pain, Low back pain, Sports Injuries. Bookmark the permalink.